Serabi Bandung is a snack or meal that market origin to Indonesia. 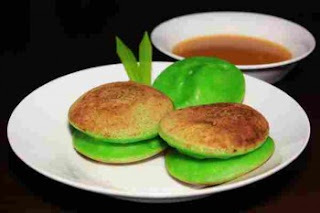 The serabi Bandung is made with wheat flour, rice flour or a combination of coconut milk. The food is served with palm sugar syrup and brown sugar with coconut milk melted. There are two kinds of serabi Bandung is made from wheat flour and Serabi made from rice flour. Besides, the original Serabi Bnadung without toppings and served only with palm sugar syrup. There are many kinds of serabi now. There are many toppings variations which can be made. It can be made by using a banana, cheese, chocolate messes, jackfruit, even sausage or bacon. The main ingredient used in the manufacture of flour Serabi is or flour which use the proven quality. The coconut milk must be derived from coconut which is not very old. Other ingredients of Serabi are brown sugar. Mix the ingredients to one source and allow stand for 20 minutes. Stir flour, salt, wheat flour, baking powder and prickly. The dough is getting smooth. Pour some of coconut milk while continuing patted the dough. Combine ingredients along with coconut milk, boil it with over low heat until boiling and then remove the filter. Pat dough and pour the other coconut milk. Pour the egg and Soji leaves. Allow the stand about 1 hour. Use a small fire to make Serabi Bandung. Heat the mold Serabi maker, then apply a little oil and take one tablespoon of serabi dough then pour over the mold which was heated. Wait until the surface of the porous pie then closed. Bake until cooked Serabi. Lift with serabi uprooted from the mold. Prepare the serabi served with coconut milk sauce. That’s all recipes and the steps to make Serabi Bandung.